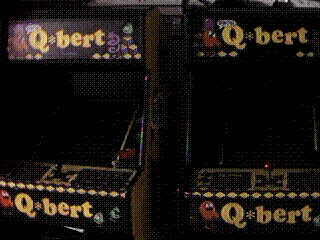 Another childhood favorite was always Q*Bert, Read up on a pair that made its way to the Basement Arcade! 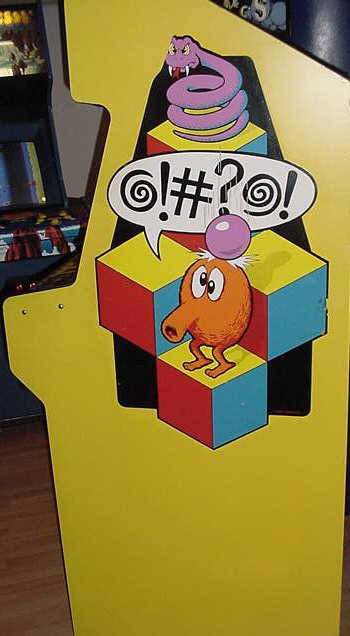 Manufactured by Gottlieb, Q*bert holds a copyright of 1982 and has you as a two-legged, big-nosed, orange creature, that jumps diagonally around on a pyramid, changing the color of the blocks you land on. You must avoid most moving objects and characters while luring Coily, the snake, to his death by jumping off the edge of the pyramid onto one of the flying disks. The game has nine levels of four rounds each. 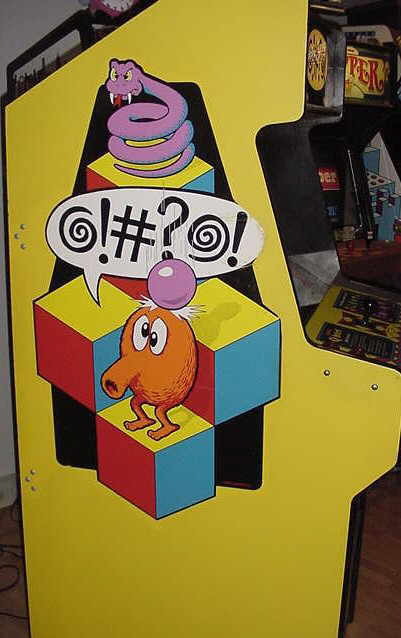 Q*Bert was always one of my arcade favorites. Looking back on things, I would guess that this was due to the fact that I could get allot of playtime for my quarter. When I started collecting, It seemed only natural that A Q*bert should be in the collection. I was lucky enough to get not one, but two machines! As part of a bulk buy of 8 machines, two non working Q*berts were included. Both were complete and in solid B shape with great side art on one and the other 90% complete. Both control panels were in the same shape, poor, but both monitors worked. 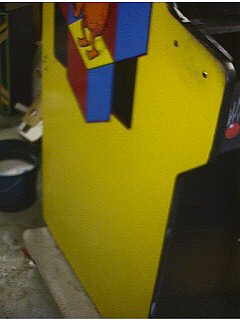 The seller also tossed in a "spare" Q*bert CPU board, but it turned out to be a Krull board instead. With both machines tucked into the shop the work began. First job was to get these babies working again. With the manual spread across the workbench, (yes, one manual was still in the machine) and a volt meter in my hand, It was quick to see that the power supply on both machines was not giving out all the voltages the game needed. With another trip out to the electronics store, I came back with everything to replace all the burnt looking components as well as the transistors and electrolytic caps which should replaced anyway due to their age. The Operator that sold me these machines was nice enough to toss in a spare CPU board. 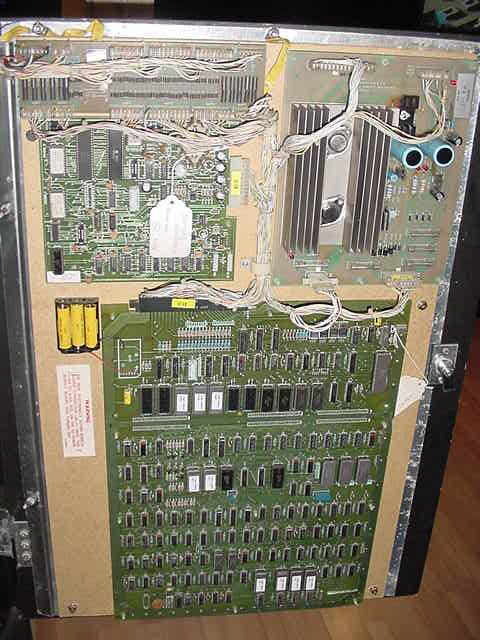 but as luck would have it, both boards would be found working after the power supplies were rebuilt. Now, This is a simplified version of 3 weeks of electrical torture troubleshooting. Let me explain. In hopes that someone reading this will not repeat the mistake I made. Look at the picture here. 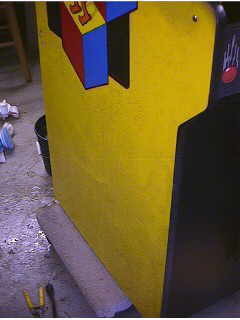 This is a shot of of the wiring on the Q*bert boards. Common practice would be to place all the connector with the stickers the same side up. But connector P4 off the Power supply board gets flipped over. If I would have sat down and studied the wiring diagram (like I finally did , determining my problem) I would have saved myself lots of aggravation! 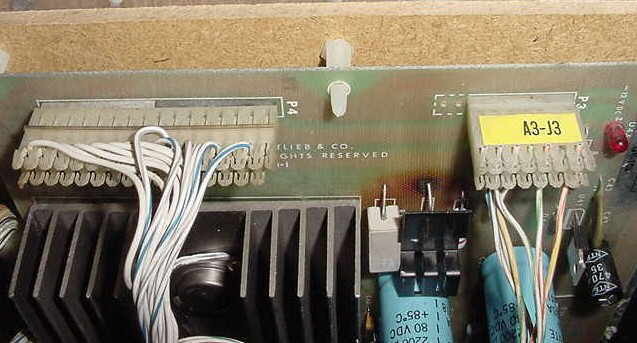 If this connector is flipped sticker side up , making a match too all the the other plugs), the main CPU board in will short out the 5 volt line right to ground and pop the fuse. Next time ill spend more time analyzing WHAT I am do rather then just pulling my hair out saying 'why doesn't the fuse pop until I plug the CPU board in?' As and additional preventive measure, I now add additional heat sinks to these power boards when I rebuild them. 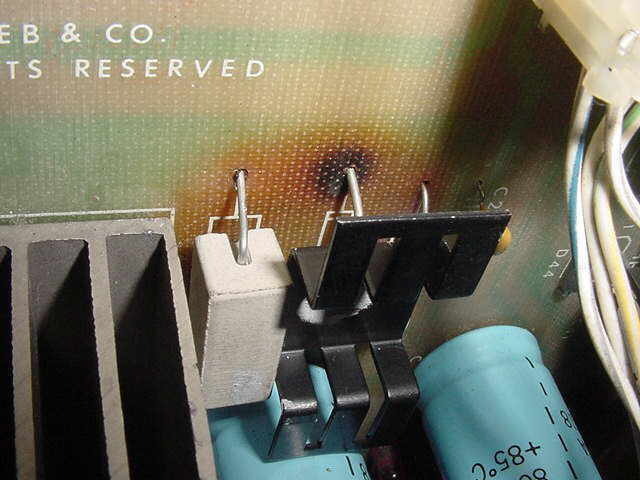 As you can see from the picture, The heat from this diode, scorched the board. With some thermal glue, The now attached heatsink lightens the thermal load a bit. Anyway with two working boards, I put in the extra CPU board the Op gave me only to find the it was a Krull board and not Q*bet at all. 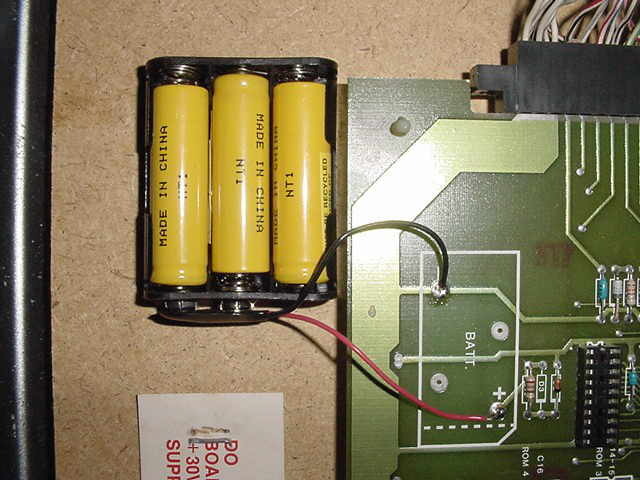 The last piece of work on the boards was to remove the rechargeable battery, and off locate it to prevent battery puke from dumping all over the boards. 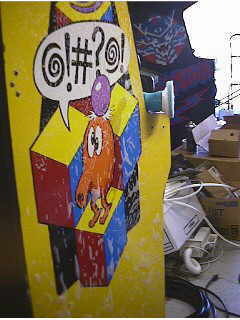 More restoration was needed in the rebuilding the "Knocker" for when Q*bert falls off the pyramid. Both units had them present but both were rusted solid. Finally, before we buttoned up the back, the inch thick layer of mold inside in the case was removed. With only one machine left, more machine changes took place. 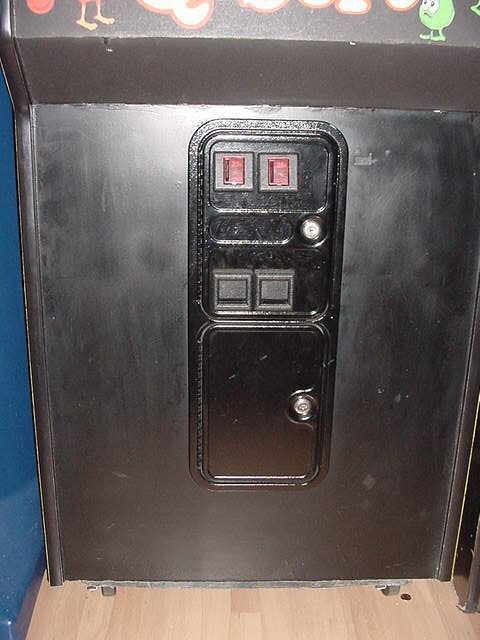 A new control panel was purchased and installed improving the machine appearance 100%. Other changes were the swapping of the marquee, from the standard marquee to the rarer Swearing Marquee pictured to the left. On a side note and a piece of history, the "swearing" marquee was originally to be the header of choice until no one knew what to call the game. I mean, how do you pronounce @!#?@! ? 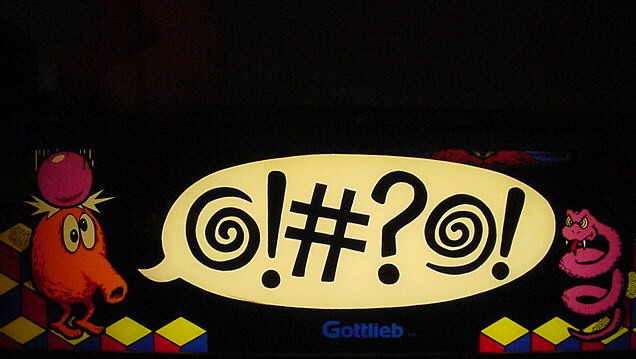 Needless to say Gottlieb chose to shrink the swear bubble and add the Q*bert name to the marquee The small remaining "swearing only" marquees are now sought after by collectors. The coin door was hopelessly mangled so I bought a new one and the marquee bulb was replaced. About this time I made my final modification. 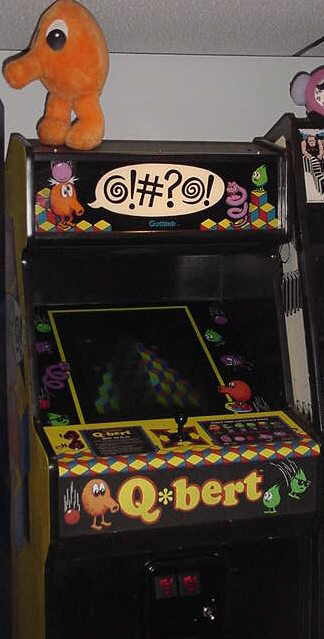 There was a sequel to Q*bert named, FHMC Q*bert. FHMC actually stands for Faster, Harder, More Challenging. 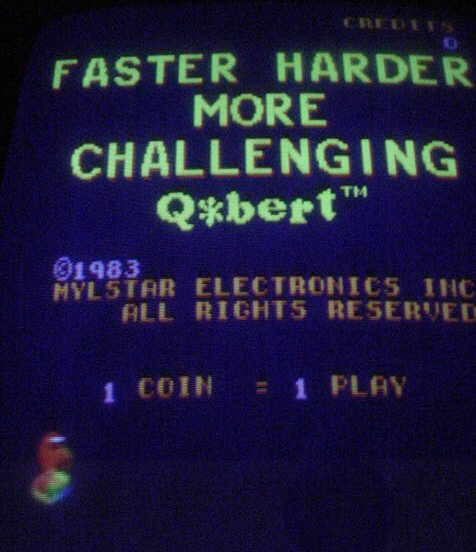 Faster Harder More Challenging Q*bert was programed by Mylstar but never went into production and no dedicated cabinets are known to exist. This game is just like Q*bert except the platforms shift position and there are bonus rounds after levels two and five. And, as the name implies, it is faster and harder :-). 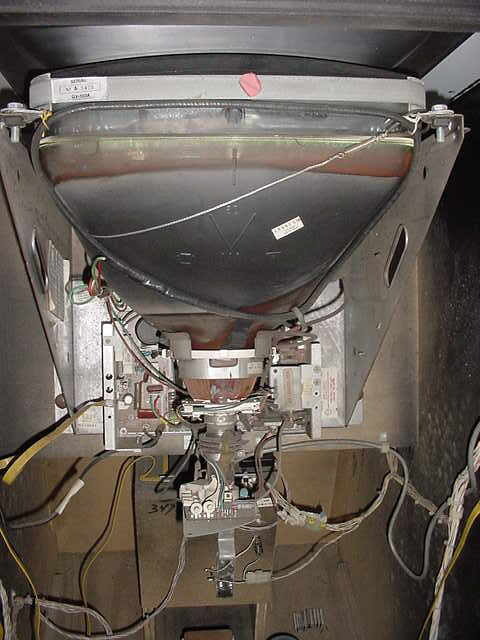 We also see Q*Bertha for the first time which is another "badie" you need to avoid! 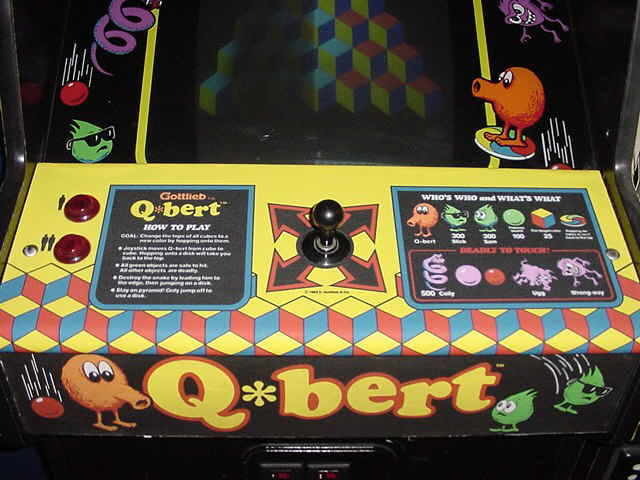 Do you have a Q*bert arcade game and need some of it's technical information? Visit the library for the full manual. Click Here for the Pin-out wiring page. My interest is strictly on full size arcade machines. 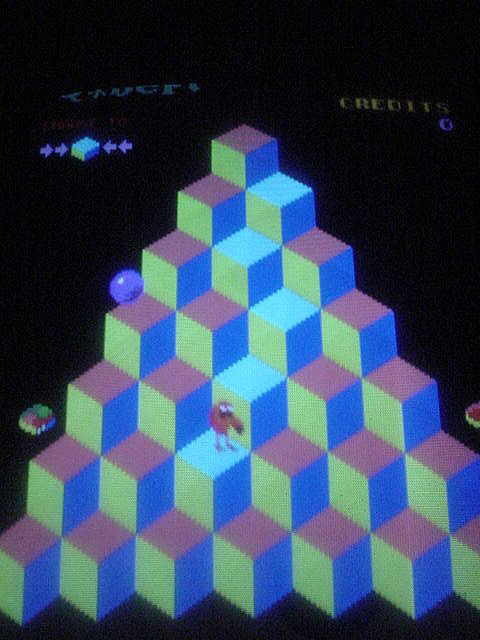 But if you would like to take a shot at Emulating Q*Bert on your computer, I do offer a link page on emulation. Visit http://www.basementarcade.com/arcade/mame/mame.html Visit the pages there, download the software for your machine and the ROM's for the games you want to play from the linked provided. Please redirect any further questions to the owners of these emulation pages as they are the experts!.